As the days grow hotter in the Grand Valley, it can be challenging to find viable recreational opportunities without retreating to the high country. Temperatures regularly reach well into the 90s, scorching our enthusiasm for riding or hiking on the valley floor. This jump in the mercury, however, coaxes alpine snowmelt into our streams, lakes, and rivers to create perfect conditions for the sport of stand up paddleboarding. Stand-up paddleboards, or SUPs, are an incredibly diverse platform. They’re as capable of delivering a peaceful sunset bob on the lake as they are a raucous romp through class II rapids. Our impressive array of desert reservoirs and alpine lakes provide the perfect opportunity to try SUP yoga or fishing, or just a pleasant paddle on a lazy afternoon. From Snooks Bottom in Fruita, to James M. Robb State Park in Grand Junction, Corn Lake in Clifton, Highline Lake in Loma, or any of the many lakes on the Grand Mesa, one could easily spend the whole summer cruising our local waters. At higher elevations, just be aware of the water temperatures. Even in the middle of the summer, they can induce a dangerous case of hypothermia if you get dunked. For such locations, people will often choose a wider board, which allows for greater stability and comfort. The Colorado River invites those seeking progression or a little more action. Its scrolling landscape, light rapids, and changing water levels ensure an engaging experience. It’s really something special to wind through the riparian landscape, taking in the towns and red rock canyons that enclose the river corridor. Multiple boat ramps and accesses allow for short 30-minute jaunts or day-long affairs. More advanced enthusiasts will often prefer a narrower board for more speed, or a shorter board to allow for more snappy handling when surfing. Note that dangers vary on the river, from changing water levels to strainers and exposure. Be sure to run a releasable leash that is easily accessible, to prevent getting caught up in debris. It’s best to start with a lake lesson where the basics can be mastered, and then progress to the river if that’s desired. The Grand Valley paddling community is small, but dedicated and growing. Valuable resources are developing that promise to lay a strong foundation for a blossoming SUP culture. 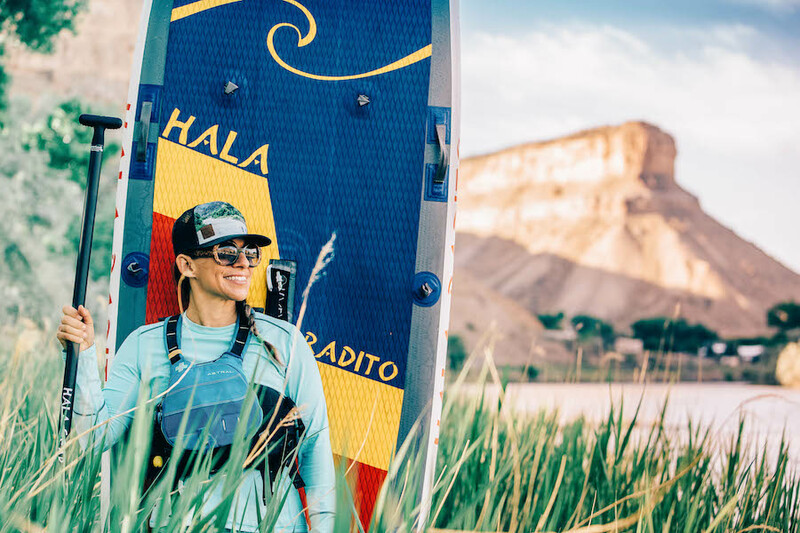 Grand Junction Stand Up Paddlboard Company (GJ SUP) is one such resource. They offer river, lake, and SUP-yoga lessons, rentals (including a rental kiosk at Highline Lake), and an impressive concierge service. In addition to renting and offering lessons, Rapid Creek Cycles in Palisade is a knowledgeable retailer for those looking to buy. Both are a great source of information on boards, locations, and group paddle events. You’ll be able to connect with them at one of GJ SUP’s group paddles (see their calendar at jsup.co) or during the much-anticipated Colorado Riverfest on July 21. Stand up paddleboarding does more than fill a niche. Its diversity, paired with our natural resources, positions it to become one of the next great Grand Valley outdoor pursuits.